This time last year, the Obama inaugural issue of Amazing Spider-Man was doing something likely unprecedented for a single issue of a comic book by repeating in the top slot, two months in a row. That didn't happen this time out, but we did have another repeat of sorts: DC's Blackest Night, after a month with no new issue on the racks, retook the top position in February. Click to see the Top 10 comics for February 2010, released today by Diamond. Every issue of the DC series has ranked #1 in comics shops for the month in which it was released. It's not the first time a series has had every issue top the charts with a one-month hiatus in the middle: as we can see here, the first seven issues of Secret Invasion consecutively topped the monthly charts in 2008 only to miss a month before Secret Invasion #8 closed out in the top position. Marvel's Siege, which topped the charts in January, placed second with its second issue. Four of the top ten comics were priced at $3.99, with the rest at $2.99. The latest Fables trade paperback by Bill Willingham topped the comics and graphic novels charts. 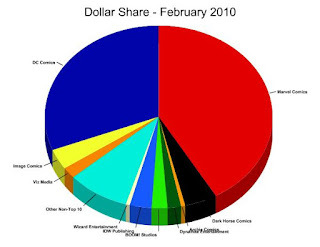 On the market share side of things, the ranking was the same for both unit and dollar sales: Marvel, followed by DC, Dark Horse, Image, and IDW. Diamond's full Top 300 tables and our estimates should be along in a few days.